It’s a Pill, It’s Vitamin Water, No It’s Superfoods! There are several ways to get the essential vitamins and minerals your body craves, but the most natural way is with food well-known for its nutritional value. The popular term “superfoods” has come to describe many of the nutrient-rich fruits, vegetables and other food types that have been naturally nourishing humanity for millennia. Examples of these superfoods include blueberries, strawberries, tomatoes, beans, nuts, salmon, whole grains, seeds, broccoli, kale, yogurt and more. The nutritional benefits of superfoods are many. Not only do they supply you with the typical vitamins and minerals you would expect to find in a supplement or vitamin water, they are also great sources of antioxidants and fiber, which are good for helping to prevent cancer and diabetes respectively. Superfoods are also usually cheaper than their unnatural alternatives, which have health claims that don’t always hold up to scientific scrutiny. Several superfoods are also good for the heart. Salmon contains omega-3 fatty acids, which help prevent heart disease. Other superfoods help lower cholesterol. 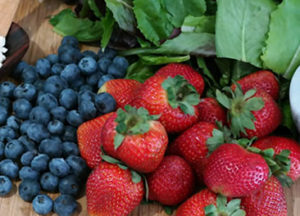 A study of 93,600 women, over about a twenty year period, concluded that “blueberries and strawberries tended to be associated with a decreased risk of MI” (MI stands for myocardial infarction, or a heart attack). We at GoodFarms offer both blueberries and strawberries, which are high in antioxidants. We also offer several types of tomatoes, which are high in vitamin C and lycopene, an antioxidant which may reduce the risk of cancer, heart disease, and age-related eye disorders. Sometimes truly eating healthy can seem difficult, but with the wide variety of bite-sized and ready-to-eat superfoods that are easily available, such as berries and grape tomatoes, there are many ways to ensure that all your meals are both nutritious and delicious every day.